In today’s world, trust seems to be a remembrance of days past. We all long for the good old days when things were simpler and we could trust people to be who they are and do what they promise to do. In creating the WOW! Videos, we realized that by creating those videos what we were truly trying to do was show our customers the truth about our machines and our industry. It was like a light bulb went on for us as we got deeper into the articles we were writing and the videos that we were shooting. When we go to trade shows and customers shop from one dealer to another, those same people come to us and share with us, the distortions and outright untruths about what our competitors say about our machines and our company. Yes, this hurts but it does seem to be the way that some of our competitors operate. Sad but true. As in one of our recent experiences, the CEO of one of our competitors told a potential customer of ours some blatant lies about our machine and our company. We would never think of doing this. Yet, while the same customer went to another reputable dealer that is one of our direct competitors, they attempted to sell their machine without the lies. They just provided information and showed their honest belief in their machine. They presented with their heart. That can be seen in the eyes and body language of the sales person. A potential customer who has done their homework can tell when a prospective sales rep is lying. “Let’s talk about trust. 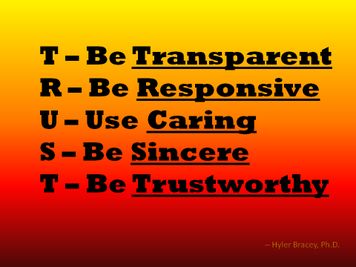 So what is trust? Rather than giving a complex definition, we prefer to use the words of Jack Welch, former CEO of General Electric. He said, “You know it when you feel it." The people who are buying machines of this caliber are educated, smart and street-wise. To say the least, they have been around the block a time or two in business and in life. So fooling someone who is making this type of purchase is not going to be a "walk in the park". Yet, there are those companies that will stoop to untruths to make a sale. We simply will not do that. We will give our customers rock solid information that is truthful and helpful in making a high-end purchase such as a Longarm. Buying a Longarm is equivalent to what some people paid for their homes years ago or a car today. Those are not every day purchases. They require investigation, thought and trust that what they are buying and whom they are buying it from, is going to fulfill their needs, be as close to maintenance-free as it can be and be fairly priced and get the support they need during the life of it’s use so that they can AND will enjoy their purchase from years to come. Here at AQ, our customers many times become our friends. Going to trade shows for us is somewhat like old home week. Our past customers come to visit and many times bring their friends. There is laughter, smiles, handshakes and hugs. Those type of relationships are not built on distrust. Our organization has been built on long hours, hard work, caring, kindness, commitment and yes, a HUGE dose of trust. We would not be the nation’s leading Innova dealer two years in a row and in business for 14 years through one of the most horrific economic times, if we had not earned our customer’s trust and their business. So please watch our videos and read our articles and know that you are in good hands before, during and especially after the purchase of your new Innova longarm from Accomplish Quilting. Jeff Benedict with his father Clarence Benedict. Clarence and Loretta started AQ and Clarence works in the business still today!